In this exercise your task is to work out what price participants should be charged for a 10 week drama program for kids that is 2 hours per week. You will need to create a simple spreadsheet for this task but you are given a suggested format and this will make your task easier. 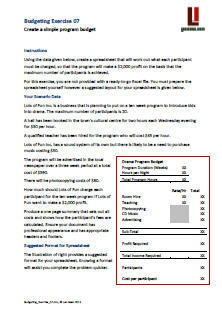 A small amount of income and expenditure information is provided for the scenario which may take 15 minutes or less. Try always to make your spreadsheets have a professional appearance with appropriate headers and footers.